Warning: Please understand the risk if you decide to modify the Fatshark battery case. I and Fatshark will not be held accountable for any damage caused. Looking for good 18650 battery for FPV Goggles? I tested a few and found out which is the best. You don’t have to buy the expensive Fatshark battery holder in order to use 18650 cells, you can make a cheap DIY one. Long Silicone Electrical Wire – 20cm+, ideally 22 AWG or larger. Because of the missing middle wire in the balance lead, we cannot balance charge the battery. To “fix” that, we need to add in the brown wire as shown the following connection diagram. Step 1, take one wire from a spare balance lead, and insert it into the empty middle slot in the balance plug of the Fatshark battery case. Step 2, slightly tin the tab on the lid with some solder. It’s easier if you scratch the surface first. Step 3, extend the wire from the balance lead, and solder it to the tab on the lid. Step 4, make a little hole on the case near the solder joint for the wire to go though. Finally, put some tape over the wire to protect it. This is the final result, you can now “balance charge” it as a 2-cell battery, without removing the 18650 cells. Note, because the 18650 cells are inside an enclosed case, there is no cooling and therefore the battery can get hot during charging. Make sure you charge at slower rate to avoid overheating the battery. Im charging those inside the case, can you tell why its not desing to charge it like this? 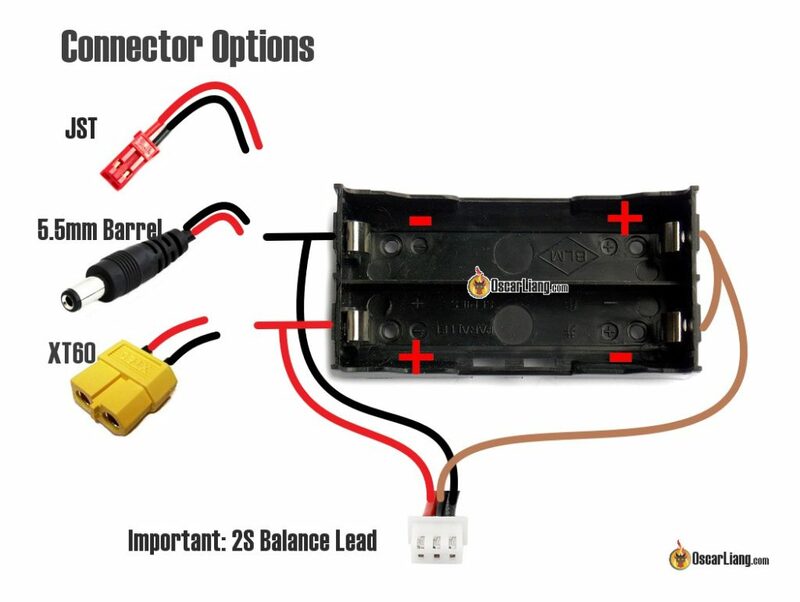 Same as standard and old version of fatshark battery.. without balancer. maybe Fatshark doesn’t want to get the blame for the fire when people charge batteries inside their case.